Marabou recently visited the Bard Graduate Center Gallery to see “The Story Box: Franz Boas, George Hunt and the Making of Anthropology.” The exhibition explores the history and legacy of The Social Organization and the Secret Societies of the Kwakiutl Indians. Published in 1897, the book is one of the first major, comprehensive documents of a Native American culture written from an Euro-American perspective, and is considered a seminal work in the field of anthropology. Franz Boas, a German-born American thought of as the “Father of American Anthropology,” and his Indigenous (Kixitasu’) research partner George Hunt spent years studying the lives and practices of Kwakwa̱ka̱’wakw people in British Columbia. Social Organization is the culmination of their work. The exhibition highlights three major elements that affected the creation of the book, but were omitted by Boas: 1) “Canada’s assimilation policy, which outlawed potlatch ceremonies,” 2) “the 1893 Chicago World’s Fair, where Boas and Hunt conducted much of their fieldwork,” and 3) “Hunt’s proper status as co-author.” The exhibition is an outgrowth of a larger project, a Critical Edition of The Social Organization and the Secret Societies of the Kwakiutl Indians that addresses these three points, and incorporates Hunt’s corrective notes on Boas’ misinterpretations and inaccuracies. “The Story Box” offers insights into Boas’, Hunt’s, and their book’s legacy. For Marabou, the exhibition is also a case study that considers the many facets of cultural documentation processes. “The Story Box”: 1) reveals the actual subjectivity behind information presented as observed, objective “fact” and 2) complicates the idea of what it means to “collect” objects for research purposes. For Marabou, this quote captures Boas’ good intent, but also hints that ethnographic research is not ego-free. Boas believed he was delivering an accurate account of Kwakwa̱ka̱’wakw culture in his book. The exhibition, however, points out that Boas made a number of mistakes. One example is when Hunt tried to correct Boas’ interpretation of mask types. Boas was lumping a certain group of masks together saying they represent the same thing while Hunt said that each mask held different meanings. Boas dismissed Hunt’s claims because, per the exhibition text, Boas was “concerned that Hunt’s sources were relating the masks to mythology in order to raise their financial value.” Today, we acknowledge Hunt’s differentiation is correct and Boas was mistaken. In 1920, Hunt told Boas there were a number of inaccuracies within The Social Organization and the Secret Societies of the Kwakiutl Indians. With Boas’ encouragement, Hunt annotated, revised, and corrected the entire book. By 1933, when Hunt passed away, he had amassed a manuscript with over 600 pages of corrections and edits. Gallery text announced that, “this exhibit and the larger 1897 Critical Edition are bringing Hunt’s archival notes back in connection with the book, museum collections, and Kwakwa̱ka̱’wakw families for the first time.” From mistakes in the text, the exhibition went on to explain that some of the book’s documentary images of Kwakwa̱ka̱’wakw culture were also not totally objective or accurate. A major point of the exhibition is to highlight that much of Boas and Hunt’s research and documentation did not take place in British Columbia, but at the 1893 Chicago World’s Fair. Chicago was the site of a lot of fieldwork because Canada had outlawed the potlatch, an integral communal and economic practice of the Kwakwa̱ka̱’wakw and other Indigenous people from the northwest coast of present-day North America. A potlatch could be held in Chicago because it was not on Canadian land. As curator of the World’s Fair’s Anthropology Department, Boas invited members of the Kwakwa̱ka̱’wakw to be on display. This allowed Boas and Hunt to photo document aspects of the potlatch and other ceremonies. The exhibition does a nice job of showing how images, like drawings and photos, meant to serve as official documents of culture are not made or recorded as authentically as we would think. ABOVE: “Chief Delivering Speech at Festival” print of painting by Wilhelm Kuhnert, Plate 10 in book The Social Organization and the Secret Societies of the Kwakiutl Indians, 1897. BELOW: photographs from Fort Rupert, British Columbia used as source material to create the composite image “Chief Delivering Speech at Festival.” These photos are in the collections of the American Museum of Natural History and National Anthropological Archives, Smithsonian Institution. Some other examples are photographs that appear in The Social Organization and the Secret Societies of the Kwakiutl Indians, taken at the Chicago World’s Fair, of men in traditional ceremonial dress. Above is video of the interactive installation that allows visitors to slide between the original photograph and the image that appeared in the book. The image shown is called “Dance of the Hamatsa.” The Hamatsa is a secret Kwakwa̱ka̱’wakw society. In the background of the original photo, there are white sheets to hide the industrial buildings in the distance. The photo that appeared in the book only shows the main subject of the photo, the men sitting behind him and all other context were removed. For Marabou, the backstory of photos like “Dance of the Hamatsa” is not problematic like the composite illustrated print “Chief Delivering Speech at Festival.” Regardless if the photo was taken in Chicago or Canada, the man would have worn the same ceremonial clothing. The deception is not in the content, but in how it’s presented. Boas was operating in a period when non-white, non-Western European cultures are being studied as exotic fascinations. Researchers were presenting information, both written and visual, as recorded directly as it was seen or heard in the field. In reality, writing was very edited and photographs staged and sometimes even manipulated. The exhibition highlights a very important point about early anthropological studies, don’t always believe the documentation as absolute truth. Ask questions, particularly about context and methods of collecting information. When it comes to collecting information, anthropologists were not only writing and taking photos, but were also obtaining objects for study, and eventual museum display. Settee backrest, Unknown maker, Kwakwa̱ka̱’wakw, Wood, pigment, metal, Collected by George Hunt 1898-99. In the collection of the American Museum of Natural History, NY. Marabou has brought up questions relating to ethics around acquisition and collection processes in previous posts. These questions include, how were objects obtained? Were they bought? Gifted? Stolen? Many of the labels of the objects in “The Story Box,” read “Collected by Franz Boas” or “Collected by George Hunt” and are currently in a museum collection. This doesn’t tell us much about how the objects were collected. However, one object’s acquisition is explained. A settee that originally belonged to Chief Q’alaidi of Hope Island is decorated with the crest of the Sisiuł, a double headed serpent. Boas used this settee in a publication that discusses traditional Sisiuł motifs. Apparently, the owner of the settee was still using it and did not want to sell it. After two years of trying to buy the settee, Hunt, according to the exhibition text, “asked a creditor to call in the owner’s debts so that he might be compelled to sell it for a much lower price than initially offered.” The details of Hunt’s purchase complicates and adds nuance to the idea of collecting. Although official documentation may say someone bought an item or received it by legal means, in circumstances of colonialism and ethnographic study, it’s important to consider whether objects were acquired through manipulation or sold under possible duress. Sometimes an extremely dedicated researcher will sacrifice personal ethics for their work. The Social Organization and the Secret Societies of the Kwakiutl Indians became a landmark work in the field of anthropology and also became an important resource for Kwakwa̱ka̱’wakw culture. A quote at the end of the exhibition is from William T. Cranmer, Chief of the ‘Namgis First Nation, Kwakwa̱ka̱’wakw, “A large part of our history wouldn’t be there…if it wasn’t for George Hunt and Franz Boas.” Because of oppressive Canadian laws, Kwakwa̱ka̱’wakw cultural practices could have faded with each successive generation. Boas and Hunt’s book is one source for the reactivation of Kwakwa̱ka̱’wakw culture. Despite some of its problems, there is still great value in Boas and Hunt’s work. Although imperfect, The Social Organization and the Secret Societies of the Kwakiutl Indians is valued by the Kwakwa̱ka̱’wakw community as a reference for objects and language that have been lost. The Critical Edition of the book will realize Boas and Hunt’s intentions, to serve as an accurate reference of Kwakwa̱ka̱’wakw culture for and with the input of Kwakwa̱ka̱’wakw people. The original edition of The Social Organization and the Secret Societies of the Kwakiutl Indians is just one example of inaccurate, and/or incomplete cultural records that have been circulating for decades. As we work to correct these records and histories, Marabou reminds us that correcting the histories alone is not enough, we must also understand and change the structures and forces that lead to inaccurate documentation in the first place. Academia and research are fraught with bias. In order to make long lasting impact, we need to not only amend, edit, and change the work produced, but also change the systems that produce the work. Marabou stands in front of a transformation mask made by the great-granddaughter of George Hunt, Corinne Hunt, and her husband David Mungo Knox. A mask like this was illustrated in Boas’ 1897 book, but was not fully explained. George Hunt eventually revealed that the original mask belonged to his first wife. The family connection inspired Corinne to recreate and reactivate the mask. Created in 2018-19. Cedar, pigment, string, hardware. Owned by the Hunt Family. 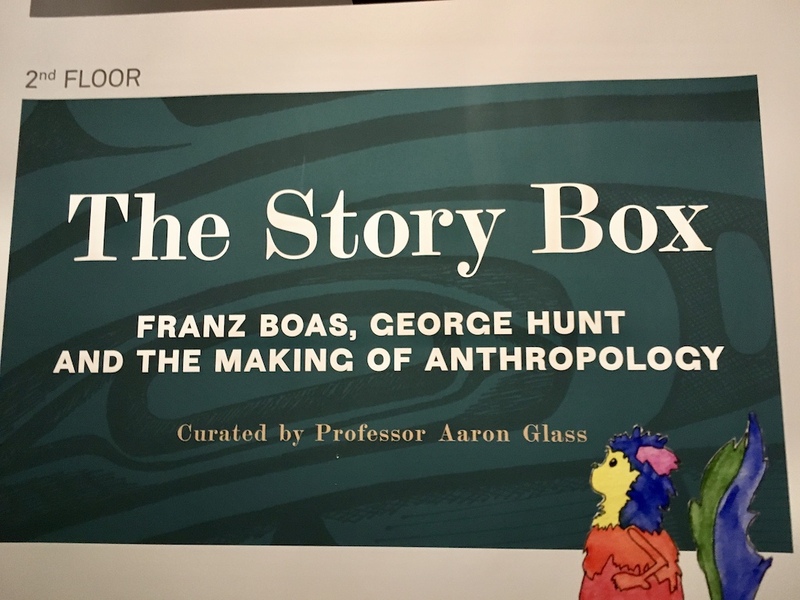 “The Story Box: Franz Boas, George Hunt and the Making of Anthropology” is curated by Aaron Glass and runs until 7 July 2019 at the Bard Graduate Center Gallery, 18 West 86th Street (between Central Park West and Columbus Avenue) in New York.